The competition and collaboration among the manufacturers within PV supply chain keep repeating itself in the rapid-changing PV industry and it happens to be the same in the inverter market. During the downturn of solar market in the end of 2012, many second-tier inverter manufacturers in Taiwan gradually exited from the market. Satcon, one of the largest inverter companies in North America, also declared bankruptcy due to debt issues. 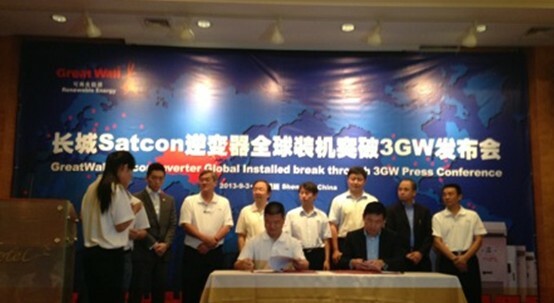 However, with the market warming up, Satcon’s financial impasse has been solved by receiving the benefit from the subsidiary of fortune 500 China GreatWall Computer, GreatWall Energy, who currently has a capital ownership. Recently, EnergyTrend has the honor to interview SIC, the exclusive agency for Satcon’s inverters and components, to discuss the current condition and prospect of PV inverter market in Taiwan. The assistant manager of SIC electronics & new energy division, Justin Lan, indicates that during the time when there’s no FiT regulations in Taiwan, certain UPS manufacturers successively entered the inverter industry because the concept of UPS products is similar to that of inverters. After the government announced the FiT in 2009, more large-scale power plants within the nation demanded for central inverters. At that time, many European and US manufacturers successfully entered the Taiwanese market due to the complete product specification. For now, most of the inverters that are used on commercial systems in Taiwan mainly rely on US and Germany imports. In the area of residential systems, price would be the major concern, thus most of the focus there is on inverters made in Taiwan and China. After all, the competition in Taiwan’s inverter market has become intense. The key lies on brand itself, stability, power efficiency, and customer service, etc. Take the brands that SIC represent for example, both Satcon and Delta, have the characteristics of high brand awareness, organized production lines, and good stability. SIC also holds accountable some of the major EPC (Engineering, Procurement, and Construction) manufacturers and customers to increase market share. Currently, Satcon’s market share has reached more than 70% with total amount of grid-connected installations being 80MW in Taiwan. SIC faced serious issues when first stepping into the inverter market. Usually, manufacturers will not contact the clients until problems occur. Yet, SIC choose to think from different perspective that views clients’ long-term operation as the critical value as sales. The director of new energy application, Chamber Pan, indicates that SIC has to fully participate in every procedure to earn clients’ trusts. The procedures are as follow – consult with the clients to understand their needs, communicate before clients placing orders, inspect after receiving the products, test before grid-connected, engage in real-time communication with the power company from the beginning to the completion of grid-connection, send follow-up reports, and send maintenance reports during maintenance services. As for professional technique, all maintenance staff has to be trained by Satcon and be certificated. By accumulating experiences, engineers are equipped with skills to fix errors. When talking about future development, Justin says that they will be focusing onto two directions. One is global development and another is the extension of serving as Satcon’s agency for inverters and modules. In terms of global development, SIC has set up a branch office in the US and will start providing customer service for Satcon’s inverters this month in North America. It may be tough for them to get in touch with the US clients due to Satcon insolvency, but there has already had six thousand original Satcon products in North America. Having said that, SIC will not only stand in a better position to receive existing customers, but also provide professional technology consultant services to clients. Furthermore, GreatWall Energy with excellent financial condition can help the market expansion. In another words, SIC will do their best to earn clients’ trusts. To the extent of expansion, power plants currently require 20-years of guarantee. But issues such as power plants that no one takes care of or high maintenance fees caused by foreign companies’ low price entry in the earlier phase shows the importance of follow-up service while operating power plants. Aside from the subsidiary established by SIC this year in handling maintenance, they also developed a monitoring system to correspond to various brands’ inverters. Moreover, there are inventory for spare parts and components that can offer clients’ needs anytime. There will be no more financial burden as SIC serves as Satcon’s exclusive agency for inverters. Having SIC’s competence and current domestic market share, it is believed that Satcon will be able to find back the high-quality product reputation they once had. The FiT for solar energy generation in Taiwan will be revised downward by 14%-16% next year. With tariff rates gradually reducing and PV system installation amount increasing, the stability of inverters will directly affect power plant operation and payback period. Manufacturers not only have to keep lowering the cost to maintain competitiveness, but also have to come up with diversified strategies in order to provide integrated service. Since brand and localization are the two main focuses for inverters, SIC will keep original brand Satcon and localize the operation in Taiwan. Apart from serving old clients, they also work hard on expanding the new businesses. By applying their EPC expertise, SIC is determined to earn back clients’ trusts toward Satcon and further move toward global market.